What's the Best Way to Shovel Snow? Many people moving to a cold climate for the first time wonder, What's the best way to shovel snow? For that matter, even if you have been dealing with snow and ice your whole life, you may never have thought of the tips given below. Following these little tricks can make the winter season go a bit easier for you. The basic idea behind the advice given below is this: The best way to shovel snow is to work smarter, not harder. Avoiding unnecessary work allows you to shovel snow more effectively. And always make sure you've picked the right shovel for the job. Do you park your car in the driveway (as opposed to in a garage, for example)? Then shovel a path to your vehicle first. Then start the car and begin defrosting the windshield. You might as well start this process right away, letting your defroster do its job while you're busy shoveling. By clearing a path to your vehicle first, you avoid packing down snow on the way. You would have to shovel that same snow later, anyhow, and packed snow is tougher to shovel than unpacked snow. So take care of it right from the get-go. Don't bother too much about the remaining snow around your car at this point. Later, when you clear the snow off of your car's windshield, roof, etc., you'll be left with a ton of new snow all around the edge of your car. To be efficient, it's better to wait and remove it all at once in one final "touch up" at the end of the project. Remember, every additional scoop you make is extra strain on your body. Unless you're in great shape and treating the project as an opportunity for a workout, you should be aiming for the conservation of movement. Shovel snow somewhere else while you're waiting for your car's defroster to heat up the windshield. At some point after the snow and ice has been loosened by the heat, you can begin clearing it off of your car. After it's all down on the ground, you can finish shoveling snow around the perimeter of your car, getting this part of the job out of the way once and for all. Also don't fuss too much right away about shoveling the snow where your driveway intersects the road. As snow plows go by, they'll be filling that area with more snow. Reserve this area till you're ready to pull out with your car, or till after you've gone inside for a hot chocolate break near the end of the project. In fact, if you won't be pulling the car out of the driveway at all that day, you may want to wait till the snow plows have finished plowing the road before tackling that part of your driveway. It can be frustrating to think that you're done with the job, only to find out later that you've been plowed in again. But when you do finally tackle this part of the driveway, be sure to take it in stages. This will be the hardest part of the project. The snow here is likely to be icy, and each shovel full will be heavier than a normal shovel full of snow. In fact, the best way to shovel snow, in general, is to break up the job into smaller parts, resting in between. 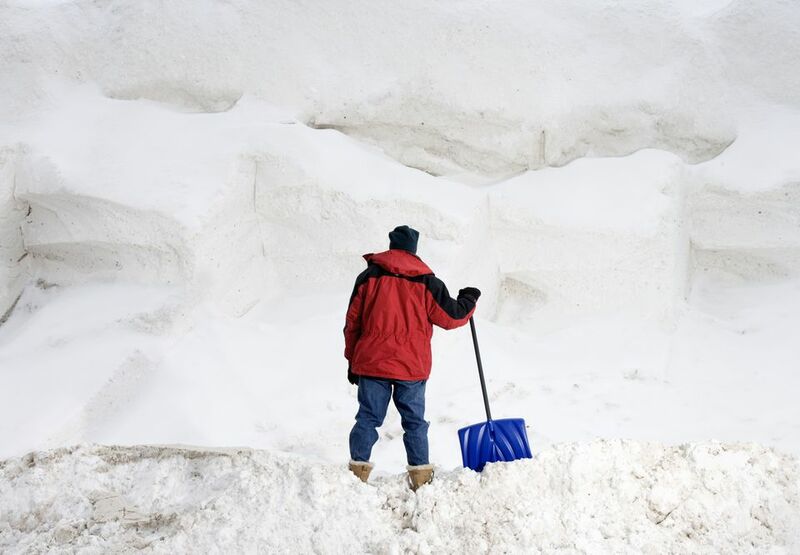 Try to clear your driveway in stages, rather than in one fell swoop. If the snowstorm has already ended, divide the workload into sections. If the snowstorm's still in progress, do some initial snow shoveling, then go back to finish after the storm. What happens when the next snowstorm comes? Those huge snow piles lining your driveway will be right in your way, making it harder for you to toss the new snow. Another mistake people make shoveling snow is forgetting where walkways or paths are that provide access to outbuildings, compost bins and the like. For example, they'll start out by piling snow from the driveway onto a path to an outdoor storage shed, only to realize later that they need to clear off that path. So they end up moving the same snow twice. If you accept the idea that the key is to avoid unnecessary work, this is not the best way to shovel snow. You could follow all of the tricks above and still end up with a bad back the day after shoveling. That is why it is important to relate one more piece of advice, in conclusion. What is needed is a basic understanding of the strengths and weaknesses of the human body. You do not need any special training to gain this understanding: simple common sense is enough. On the way down, do access the snow by bending your knees, thereby lowering your body. Do not try to get down to the snow by bending your back. On the way up (that is, once you have a scoop of snow on your shovel), do use the muscles in your legs to raise yourself back up. Also, do keep the load in close to your body. This will minimize the stress on your back. Do not try to stand back up with your arms stretched way out away from your body. When you do so, your back is lifting the weight of that snow on your shovel blade. Even if you don't feel it right away, you may feel the pain tomorrow. When Should You Prune Your Holly Bush?